Plant a tree while buying your next pair of headphones with the House of Marley Exodus. The House of Marley Exodus headphones are a stylish, eco-friendly option for listeners. The aluminum and FSC-certified wood materials feel premium, complementing the sleek design. The rotating and folding ear cups make these a solid pair of travel cans, despite the large 50mm drivers housed within the ear cups. Audio brands work extensively to separate themselves from others. Some companies focus on style, others on durability, but the House of Marley Exodus brings something else to the table: sustainability. The FSC-certified wood coupled with aluminum components makes these eye-catching, but are the nice design and sustainability efforts enough to warrant the $200 price? Who is the House of Marley Exodus for? The $200 House of Marley Exodus headphones feature FSC certified wood ear cups and aluminum accents. The House of Marley Exodus is for the environmentally conscious consumer. In a market overrun by companies vying to outshine all others, House of Marley boasts of its responsibly sourced materials and reforestation initiative aptly named Project Marley. The House of Marley Exodus reproduces a bass-heavy sound, making these a great alternative to Beats. What’s it like to use the House of Marley Exodus? The round ear cups are spacious and deep enough to avoid rubbing against the outer ear. The FSC-certified wood and aluminum build is sure to attract attention. Each ear cup is embossed with the House of Marley logo and houses a 50mm dynamic driver, which pumps out a rather bass-heavy sound. Extending out from the wooden chambers are memory foam ear pads. These are incredibly comfortable and a pleasure to wear even with glasses. Its metal pole adjusters feel sturdy and offer enough resistance to hold its place without requiring an excessive amount of force to modify. Unfortunately, the headband suspension mechanism doesn’t effectively distribute the weight of the Exodus, resulting in pain at the crown of the head after just an hour of listening. Even though the headphones are chunky, the ear cups are afforded a full 90 degrees of rotation to rest against the chest or in a bag. Plus, the metal hinges allow the ear cups to fold toward the headband for a compact form factor. Metal hinges seem resistant to wear and tear with prolonged use. The peripheral panel of each ear cup houses buttons and ports. On the left is the USB-C port, placed just below the power button and its four LED indicators. On the right ear cup rest a unified three-button playback control arrangement as well as a 3.5mm input. While I tend to shy away from headphones that place the headphone jack on the right side, rather than the left, the inclusion is welcome and works just as well. It's difficult to name a more attractive, well-built pair of headphones at this price point. Operating playback controls is easy since the center multifunction button sits elevated relative to the volume controls flanking it. My only qualm is that accessing a virtual assistant like Google or Siri takes longer than with most. Upon depressing the multifunction button for the directed three seconds, the headphones emit a tone which then prompts the Google Assistant tone a second later. Only after hearing that was I able to successfully make a command. This occasionally made the process up to three seconds long before I was able to say anything. While it’s not a dealbreaker, it does get annoying after a few times especially compared to headsets with full assistant integration that seem to respond instantaneously. How good is the microphone on the House of Marley Exodus? The microphone frequency response indicates that most vocal ranges will sound normal; however, real-world use exposed proximity issues. There are two ways for the House of Marley Exodus to relay your voice: via the headset’s onboard microphone or the in-line mic near the top of the 3.5mm detachable cable. The onboard microphone tests well with bearable fluctuations in frequency emphasis. However, in the real world, it’s apparent that it suffers from proximity issues. More often than not, my voice suffered from echoes. Our objective testing yielded 24.87 hours of playback at 75dB(SPL). Although this does fall short of the company’s claimed 30-hour battery life, it provides plenty of juice to get through an international flight or a couple weeks’ worth of commutes. Using the included USB-C cable is convenient and takes just a couple of hours to reach a full charge. How do you connect the Exodus to your phone? To reset pairing preferences hold the volume up and down buttons simultaneously for two seconds. To connect the House of Marley Exodus to your phone, hold the power button for six seconds, open your phone’s Bluetooth menu, and select “Exodus.” If you experience connectivity troubles, press and hold both volume buttons for two seconds. Like the JBL Live 650BTNC, these cans only support the SBC Bluetooth codec. While this does result in some audio-visual lag and lesser audio quality than aptX affords, it’s just fine for most of us. Plus, for the best audio quality, wired still beats out any codec and the company includes a 3.5mm cable with an integrated mic and remote. What does the House of Marley Exodus sound like? The headphones dramatically emphasize low-end frequencies, making these an attractive Beats alternative. The headphones don’t isolate the listener very well, which may explain the emphasized low-end repsonse. The House of Marley Exodus headphones sound fun: bass frequencies are heavily emphasized which does come at the expense of clarity. However, if you categorize yourself as a bass head then the lessened detail is likely worth the powerful low-end response. In all fairness, when a song is absent of a dominant bassline, mainly during an intro or outro, instruments and vocals are reproduced clearly. When it comes to isolation, the headphones do a decent job at attenuating external noise. Conversations from nearby neighbors still permeate the headphones’ barrier but are muffled. While traffic won’t be rendered inaudible with the House of Marley Exodus, keyboard clacking and clinking ceramic mugs are quieted effectively. House of Marley pays attention to detail right down to the TRRS plug on the detachable 3.5mm cable. Noah Kahan’s song False Confidence sounds fine with through the Exodus until the chorus kicks in. Let’s start with the good, though. The song opens with alternating picking between the A and B strings on the sixth and seventh frets, respectively. These notes are relayed clearly on their own. Even when Kahan’s vocals enter at 0:08, things sound great. Kahan’s slightly emphasized vocals take precedence over the individually plucked notes without any notable masking. Fans of exaggerated bass will love the House of Marley Exodus' engaging sound signature. Once the chorus kicks in at 0:48, however, instruments become difficult to discern from one another. While the loud, emphasized bass response can be fun, it serves as a distraction in False Confidence. When listening to the song, I strained to hear the song’s hook, “I hope I wake up young again,” over the din. What’s more, I was overwhelmed during the tail end of each chorus. This is when Kahan vocalizes repeated “Ohs” in tandem with tambourine and drum hits and powerful guitar strums. Since the Exodus can’t parse apart the instruments, audio quality and clarity are degraded. Again, this isn’t necessarily a bad thing as many of us prefer low-end emphasis above all else and actively seek it out. Should you buy the House of Marley Exodus? The House of Marley Exodus includes easy-to-operate onboard controls and a power button with LED indicators. If style and conscious consumption are two of your priorities, yes. The House of Marley Exodus is an attractive pair of general purpose headphones with a sound signature that appeals to the masses. Its design not only looks handsome, but it feels durable thanks to the metal accents and key components like the headband architecture and ear cup sliders. Ultimately, $200 is a lot to allocate to a single pair of headphones, but you will feel like you’re getting your money’s worth with how well constructed the Exodus is. Disclosure: We may receive affiliate compensation in connection with your purchase of products via links on this page. Even though we may receive compensation, we always give our honest opinions, findings, beliefs, or experiences on each product. See our ethics policy for more details. Enter: the all-new Exodus. A new cornerstone for House of Marley, Exodus over-ear wireless headphones feature a 30-hour battery life and 50mm hi-definition drivers, offering the acoustic performance you expect, with the natural Marley style you love. 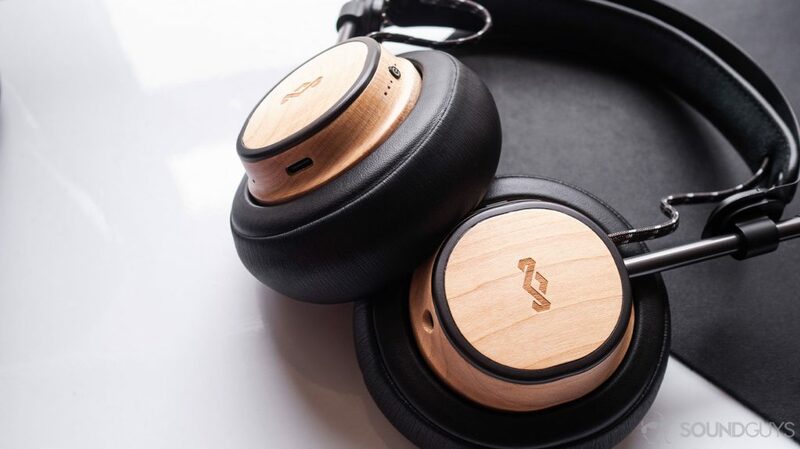 Our new flagship headphones are crafted from sustainable FSC® certified wood, stainless steel, recyclable aluminum, and natural leather; designed for easy connectivity and controls.